KIEV, Ukraine -- Ukraine President Viktor Yanukovych hasn’t acted on a pledge to the Group of Eight and European Union to seek a court ruling on the legitimacy of his coalition, which was formed after a last-minute legislative change. 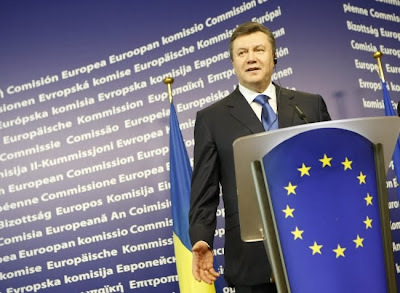 President Yanukovych holding a press conference in Brussels on March 1, 2010. “We have not received any requests from Yanukovych so far,” said Henadiy Chernenko, deputy head of the Kiev-based Constitutional Court’s press service, by telephone today. Yanukovych on March 10 told G-8 and EU representatives he had “decided to ask” the court “whether a coalition and a government formed under the new law would be legitimate.” His first bid for the presidency five years ago was thwarted when the country’s Supreme Court sided with Orange Revolution forces that made Viktor Yushchenko head of state. The parliament on March 11 created a coalition and a government sympathetic to Yanukovych, prompting opposition allegations that the legislative amendments forced through to enable the move were unconstitutional. The Constitutional Court, which in 2008 upheld Prime Minister Yulia Tymoshenko’s coalition because it was based on party blocs that represented a majority even after individual lawmakers switched sides, may have no legal choice but to brand the government illegitimate. Even so, some analysts said the court may find ways to avoid any destabilizing move. Yanukovych’s newly appointed prime minister, long-time ally Mykola Azarov, and his Cabinet won majority support last week only after the parliament adopted a law allowing coalitions based on individual lawmaker affiliations instead of party groups. In 2008, Yanukovych failed to undo Tymoshenko’s majority after the court upheld a law allowing only coalitions based on party blocs. The new government’s shaky legitimacy may cloud its attempts to approve a budget for this year and meet the terms of a $16.4 billion bailout from the International Monetary Fund. Disbursements have been frozen since November, putting in jeopardy the nation’s ability to pay for Russian gas that flows through to Europe and cover basic budgetary needs. The IMF’s resident representative in Kiev, Max Alier, on March 12 said a team from the fund will visit Ukraine this week to discuss the 2010 budget, which has yet to be passed. Alier said he had “fruitful” discussions with Deputy Prime Minister Serhiy Tigipko on the outlook for resuming the IMF program. The yield on the 2016 dollar-denominated bond declined 30 basis points to 8.05 percent at 11:57 a.m. in Kiev, according to Bloomberg composite prices. The hryvnia gained 0.4 percent against the dollar to trade at 7.9719, its strongest since Feb. 22. The credit default swap spread on five-year debt on March 12 narrowed 65 basis points to 659, the lowest since September 2008. Yanukovych’s new coalition, called Stability and Reforms, has 235 lawmakers in the 450-seat assembly and includes his Party of Regions, the Communist Party, Speaker Volodymyr Lytvyn’s group and 16 lawmakers from the parties of Yushchenko and Tymoshenko, who was dismissed by parliament last week. The IMF requires the government to cut the budget deficit to 4 percent of economic output from an estimated 11.5 percent shortfall last year. In 2008, only one of the Constitutional Court’s 18 judges ruled in favor of allowing coalitions to be formed outside party blocs. All 18 judges are sitting today. The judges may be forced to find legal loopholes to avoid the blatant inconsistency a ruling in favor of Yanukovych’s coalition would require, some analysts said. If the legislative change is ruled unconstitutional, Yanukovych will dissolve parliament and call early parliamentary elections, said Hanna Herman, deputy head of the president’s administration, on TV Channel 5.